The essence of a well implemented CRM solution is to maximize performance of an organisation by making the enabling the core business processes seamlessly. The desired objectives of CRM implementation are often linked to business performance. Companies are looking at solutions that can help them to expand on the revenue streams and also optimise the processes across board. 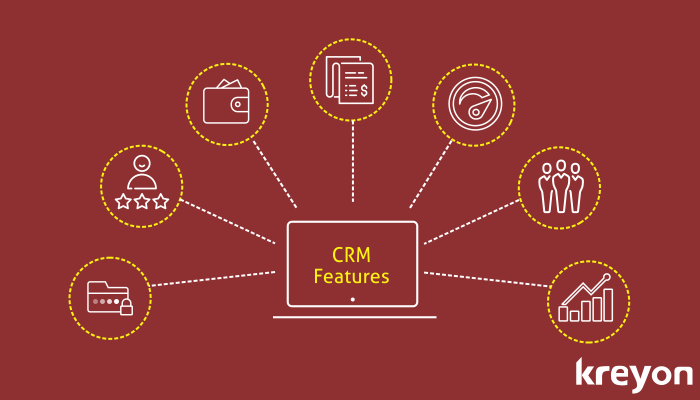 Here is a list of indicative parameters and CRM features that are helping companies to improve their business performance. a) Improving the quality of your leads: Better qualification, advanced filters and notes for quicker conversions. b) Automating reminders & follow-ups: Get automated reminders for all prospect follow-ups & activities. c) Tracing the status of leads by stages, ownership, and other relevant parameters: Organise your data by various parameters to give you maximum leverage for closing deals. Identify the hot leads and devote time for closing them. Track the number of quotations sent in a month, quarter or specified time period. Automate follow up with prospects, where quotations have been sent. The quotation drafting process requires due diligence and approvals before it is sent to prospects. The quotation module can automate the proposal drafting, approval processes and send it to prospects. Once the quotations are sent, decision makers are tracked and automated reminders are sent for getting their response on the quotation. The CRM implementation makes proposals well organised and traceable. The conversion ratios of proposals to deals etc can be analysed and improved upon using the CRM software. The CRM implementation can introduce intelligent invoicing options for companies. The implementation improves the payment collection process by automating the invoicing process. The invoices can be generated and sent to the prospects through the CRM system. An integrated invoicing & digital payment system enables the clients to make e-payments. The system also summarises key invoicing statistics like total payment collected, outstanding dues, invoices by sales persons, percentage of invoice payments delayed etc. A CRM software makes it easy to analyse the performance of employees. The revenue generated by employees, leads converted, and win rate etc can be evaluated with the CRM. The CRM software can also percentage of tasks completed on time, overdue tasks etc for every employee. The time logged for different activities and projects by employees, calls made, client visits etc. In short, CRM can effectively summarise all work related activities precisely for evaluation of employee performance. Information is dynamic. A CRM can be implemented to detect information patterns for key business activities. For e.g. correlation can be made between outstanding customer complaints & pending invoices. The customer retention data & its correlation to client service etc. When a customer complaint is not addressed on time, the repercussions for the company can be quantified with data. The CRM can help to identify these data patterns dynamically. The most critical information is pushed to the management for proactive actions and alerts. Team productivity & efficiency are the prerequisites for good business performance. CRM tool can facilitate collaboration between team members, empower sales person with the knowledge about products/services and enhance team productivity. All tasks, events, meetings, projects & discussions etc can be conducted and organised through the CRM software. The automated triggers for events and action insights are crucial for improved work performance. The expenses management and budgeting can be carried out effectively with a CRM tool. Since the CRM already has the data for all the marketing activities, projects, tasks etc., it can keep track of the expenses related to them. Companies can track their expenses, plan and budget their key marketing and operational activities with CRM tools. The management can also enforce guidelines for budgeting controls and expenses using the CRM software. With a CRM, you can create a prioritised follow-up plan for your clients. The top accounts can be tracked with respect to their value association with the company. Specialised attention can be given to top clients of an organisation for retention & cross selling opportunities. The CRM can ensure that the top management is always marked on the customer service or help desk issues for these accounts. The CRM implementation can cover hidden business patterns for the decision makers. The products with maximum customer escalations in a given time period, the most profitable products for the company, campaigns ROI, top vendors, the predictive sales revenue analysis and many more such parameters for the business. The management can drill down the key aspects of their business for policy making based on the data, compare it with previous time periods and make qualified decisions. The CRM system often comes preloaded with a set of features; however, businesses can always customise it according to their needs. For e.g. real estate clients might want to have products and services which can cover the details of their existing properties. They should also have the provision to create campaigns for renting/selling these properties. Customizations & integrations for improving the workflow of business processes is a critical step in successful implementation of the CRM system. A CRM can cover synergise different aspects of a business like sales, finance, team productivity etc to maximise business performance. A CRM implementation can manage various initiatives for improving team productivity, revenue growth & profitability. The business performance of a company can be improved significantly by introducing the right CRM for your company.